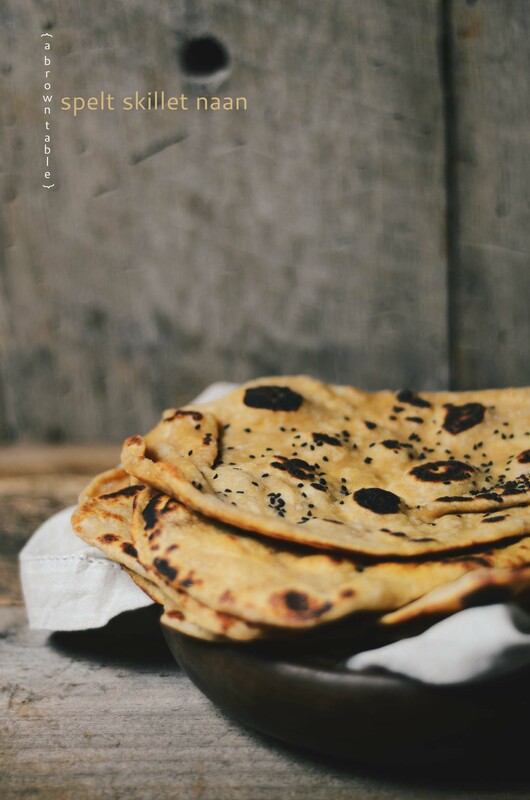 Naan, is probably the most popular menu item requested at my home whenever I invite guests over for an Indian meal. It has all the good qualities of a flatbread bread which in my opinion are: be able to sop up and grab curries, gravies and sauces or even morsels of vegetables or meat. I like my naans to be soft and tender in texture and blistered for that delicious caramelized flavor. There is also something wonderful to be said about preparing your own bread at home, be it in an oven or in a skillet. As the heat hits the dough, it brings about the warm nutty flavors of the grain, lending an aromatic sweetness to the air which makes it simply perfect. 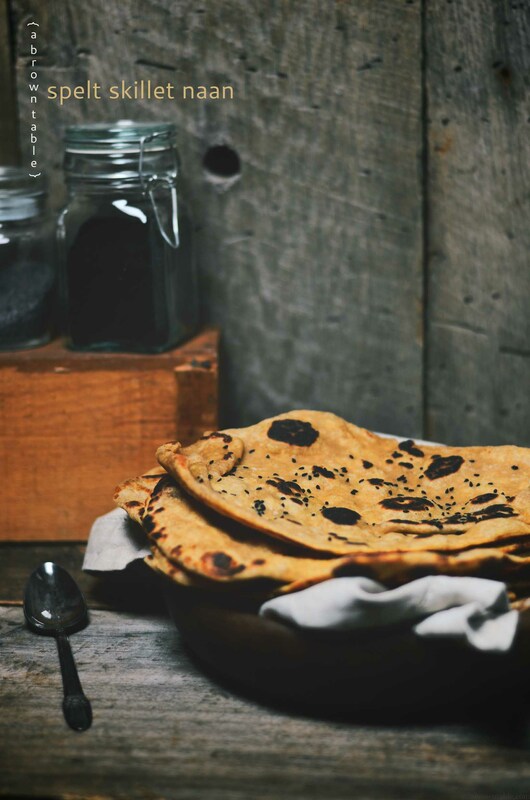 There are so many different kinds of wonderful flatbreads that are cooked in different cultures and hopefully, I will have tried my hand at making each and every one of them by some point in my life! I've shared a few naan recipes here in the past and using my skillet still remains my favorite way to prepare them. This new version uses spelt flour, an ancient ancestor of modern day wheat. 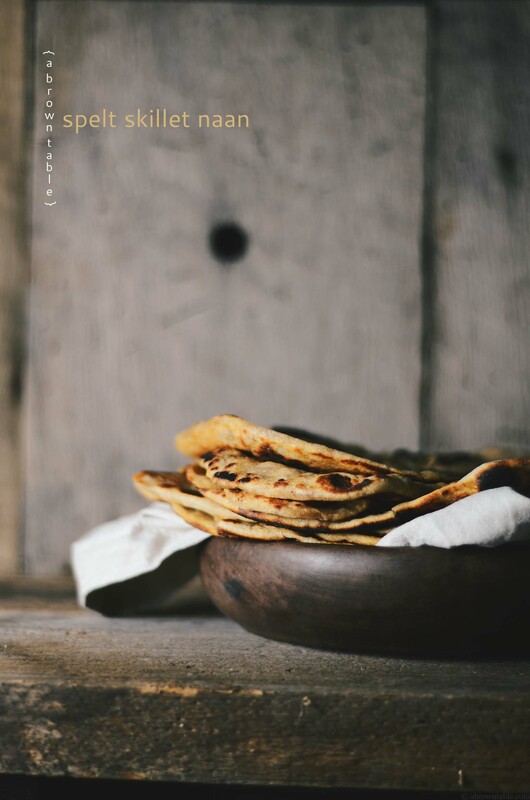 The addition of spelt to this recipe adds fiber and nutrients making these traditional Indian flatbreads a healthier option. Stick with the ratios for the two flours, here to get a soft naan. I would highly recommend using a food scale to weigh the flours, having a simple, good quality, reliable scale is really worth the investment. 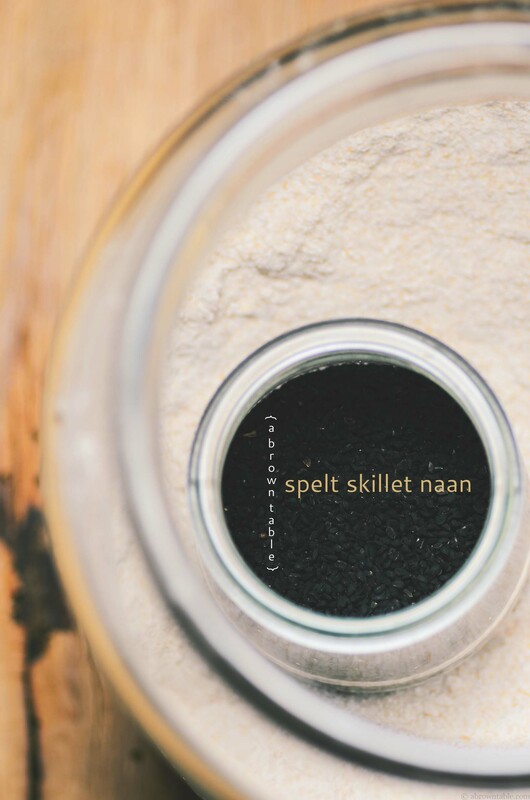 In this recipe, I use a combination of sea-salt crystals and nigella seeds to season the naan. Alternatively, you can also use my cilantro-garlic butter seasoning to flavor the naans. It is completely up to you! This basic naan recipe also works well when you want to stuff the naans with vegetables like I did previously in these pumpkin naans. To cook the naans on the skillet, you can use either vegetable or melted butter, both work great and each gives it's own unique flavor to the bread. 1. Sift the 9 1/4 ounces of all-purpose and spelt flours, salt and sugar together in a bowl. Add any grain bits that might be left behind back into the flour. Do this three times. 2. 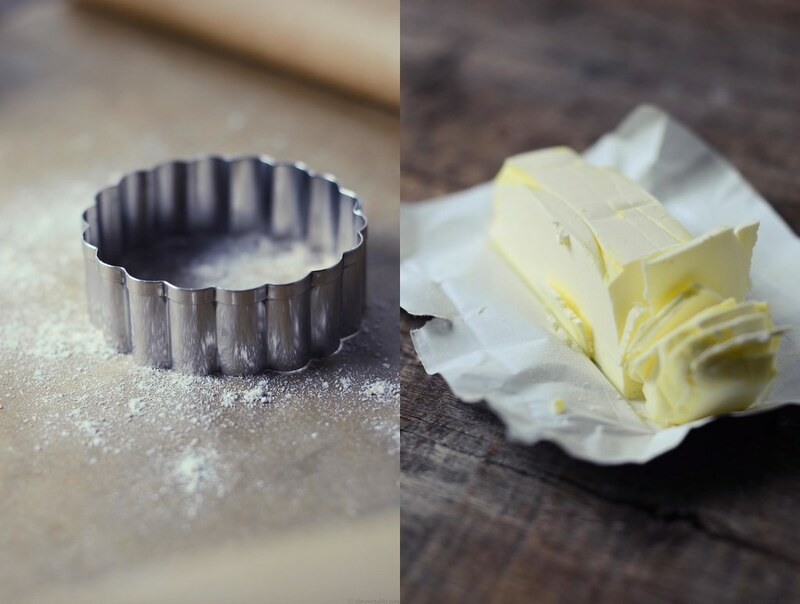 Add the sifted flour, eggs, yogurt, and 2 tablespoons of vegetable oil to the bowl of a stand mixer. Using the dough blade attachment, combine the ingredients completely and mix on low speed until it comes together to form a ball of dough. Remove the bowl from the mixer and gently knead the dough in the same bowl to form a ball. Brush the one tablespoon of oil over the dough, cover the dough with cling film and allow the dough to rest at room temperature for at least 4 hours . 3. Place the dough on a clean, lightly floured surface and divide it into 12 equal parts using a knife or a pastry scraper. The dough will be slightly elastic. Take one part and roll it into a ball with your hands. Stretch the dough into a tear-drop shape by pulling it gently in one direction and using the base of your palm to hold it down at the opposite end. Each stretched out naan should not be too thin or it will tear. Sprinkle a little bit of the nigella seeds and sea salt over the surface of the naan (you can use as little or as much as you want with the nigella and salt, I personally tend to use less salt). Press the seeds and salt crystals into the naan by rolling the seasoned surface lightly with a rolling pin. 4. Heat a skillet with a tight fitting lid on a high flame, add one teaspoon of oil and spread the oil by rotating the skillet with your hand. As soon as the oil is heat, slap the bottom surface (unseasoned side) of the naan directly on to the skillet. Cover the skillet immediately with the lid. This seals the steam in which is necessary to cook the naan and give it its characteristic blistered appearance. Drizzle another teaspoon of vegetable oil over the naan. After about 3-4 minutes, flip the naan and reduce the flame to a medium and cook for another 1-2 minutes. Remove the hot naan and keep it covered between a layer of clean cloth or paper towels to absorb the steam. Serve hot/warm. Naan is best eaten the day it is prepared, however if you need to store them, wrap the flatbread between clean kitchen paper towel sheets and store in an airtight gallon ziploc bag. 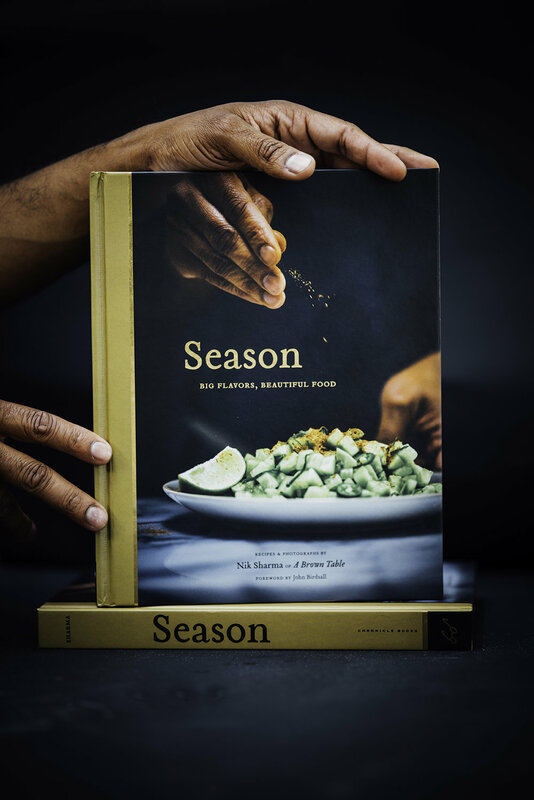 In "Bread", "Eggs", "Indian", "Nigella", "easy", "greek yogurt", "naan", "sea salt", "skillet", "spelt flour"
I generally try to enlist myself in a resolution list for the new year but this year I never put much thought into it and I guess my resolution is to simply go with the flow! The past few days have also been somewhat of an intense start to the new year. My father was hospitalized and underwent surgery, thankfully it all went well and he is making a good recovery. Biscuits are one of my favorite southern treats , they are quick breads since they do not require a rising time before baking. I like my biscuits smeared with butter and marmalade or with a little tapenade while I sip my coffee at breakfast. However, as much as my heart encompasses a passionate fondness for these delicious baked delights, I have never made them at home, until now. 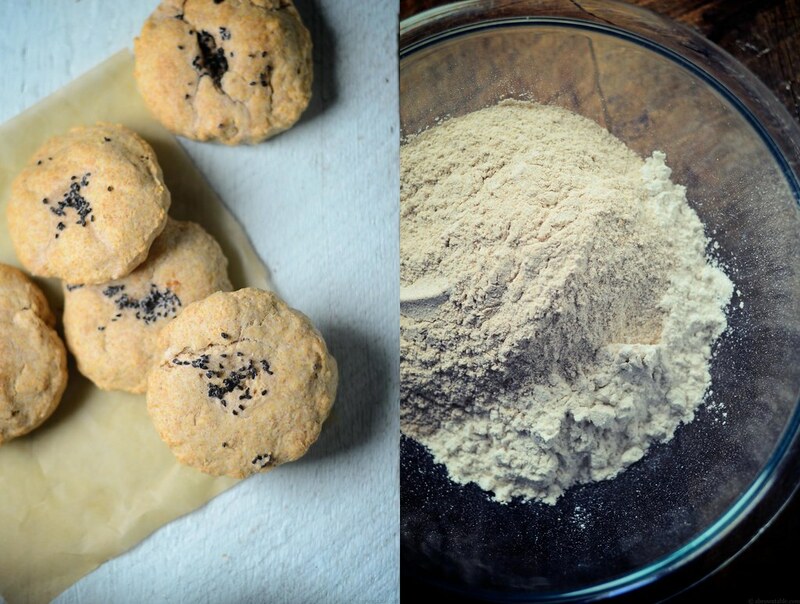 I came across a whole-wheat recipe for drop biscuits in Amy Boyce's Good to the Grain. The recipe did not involve the laborious and time-consuming stages of chilling or folding and rolling the dough, and I was immediately drawn to out. However, I did not want the biscuits to be sweet so I did make a few changes to the original recipe by eliminating the sugar and instead adding a little bit of nigella seeds mixed in melted butter for a salty savory glaze on the biscuits. The fat in the cream helps the biscuits develop an amazing flaky crust while keeping them soft inside. You can shape the biscuits dough either by hand or you can mold them in a biscuit cutter or if you are like me just use a circular cookie cutter with curved edges. 1. Place a rack in the middle of the oven and preheat to 350F. 2. In a large mixing bowl, sift the flours, baking powder, and salt twice. If any husks or bits of grain remain in the sieve, add them back to the flour mixture. 3. Using a fork, mix the cream into the flour and incorporate until the dough is completely mixed. Do not over mix the dough. 4. Divide the dough into six equal parts. 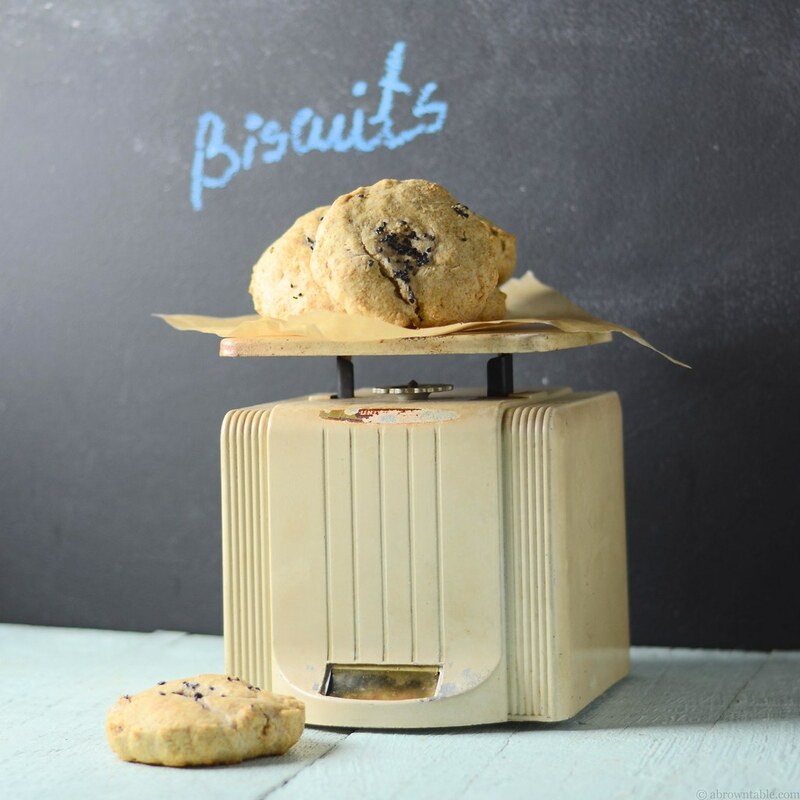 Place each dough into a 2 inch biscuit cutter and gently press to shape the biscuits. 5. Place the biscuits about 2 inches apart on a lightly buttered cookie sheet. 6. Mix the butter and nigella seeds in small mixing bowl. Brush each biscuit with this mixture and bake the biscuits for about 35 minutes till they get golden brown. Cool on a wire rack till warm. In "Bake", "Baking", "Biscuits", "Nigella", "Whole-Wheat"